1974 is an important year for the gaming hobby. It is the year that Dungeons & Dragons was introduced, the original RPG from which all other RPGs would ultimately be derived and the original RPG from which so many computer games would draw for their inspiration. It is fitting that the current owner of the game, Wizards of the Coast, will releasing the new version, Dungeons & Dragons, Fifth Edition, in the year of the game’s fortieth anniversary. To celebrate this, Reviews from R’lyeh will be running a series of reviews from the hobby’s anniversary years, thus there will be reviews from 1974, from 1984, from 1994, and from 2004—the thirtieth, twentieth, and tenth anniversaries of the titles to be reviewed. These will be retrospectives, in each case an opportunity to re-appraise interesting titles and true classics decades on from the year of their original release. For the second entry in Reviews from R’lyeh’s series of anniversary reviews, we look back to the year 1984 and the publication of one of the most radical releases in TSR’s history. 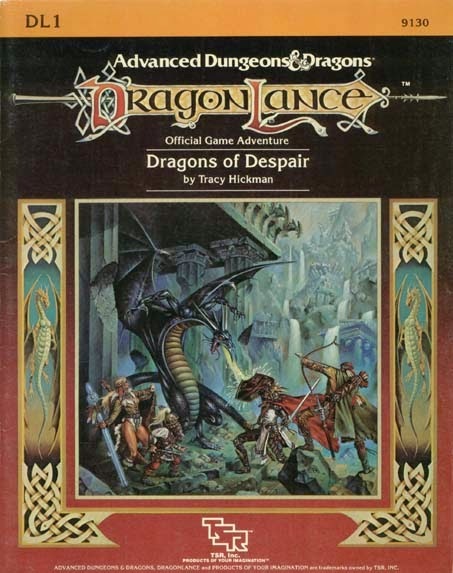 That release is DL1 Dragons of Despair, the first in the Dragonlance Chronicles, a series of sixteen scenarios that told of the truly epic tale of the Heroes of the Lance. It would introduce us to the Dragonlance setting and the world of Krynn—a wholly new setting from TSR which was also its first setting to be developed completely in-house—and it marked the first of the industry’s cross media intellectual properties. Beginning with the Margaret Weis short story, ‘The Test of the Twins’, which appeared in Dragon #83 (March 1984), the Dragonlance Chronicles would be developed and supported through novels, comics, miniatures, calendars, and so on. Although the first novel, Dragons of Autumn Twilight, would not be published until a few months later, it would prove to be extremely popular as it allowed the reader to revisit the scenarios of the Dragonlance Chronicles that he had been playing and it would turn TSR into a successful publisher of fiction as well as of games. All that was to come; in the meantime, it began with DL1 Dragons of Despair. Looking back to 1984, the physical impact of the scenario cannot be underestimated. Although it would use certain aspects of the then Advanced Dungeons & Dragons trade dress for its modules, the Dragonlance logo marked it as being very different as did the fully painted cover. This depicted the adventurers—the Heroes of the Lance—facing down a black dragon, whose name we would learn was Onyx, in a ruined, waterlogged city. It was exciting, it was dramatic, it was eye-catching, and it was unlike almost any module that had come before it. That DL1 Dragons of Despair was written by Tracy Hickman was another selling point—after all, he had co-authored the highly regarded I3-5 Desert of Desolation series and I6 Ravenloft modules. These four modules set a precedent—as did Hickman’s earlier scenario, GB5 Death in Spades for TSR’s Gangbusters RPG—for they possessed an emphasis on storytelling that would come to the fore in DL1 Dragons of Despair and its sequels..
An adventure for Advanced Dungeons & Dragons, First Edition designed for characters of between Fourth and Sixth Levels, DL1 Dragons of Despair could be played with characters of the players’ own creation, but that was not the author’s intent. Rather, the players were meant to take one of the eight pre-generated adventurers—the Heroes of the Lance—that came with the module and roleplay his or story throughout the Dragonlance Chronicles. Each of the eight—Tanis Half-Elven, Sturm Brightblade, Caramon Majere, Raistlin Majere, Flint Fireforge, Tasslehoff Burrfoot, Riverwind, and Goldmoon—is accompanied by a paragraph or two of background in addition to his or her stats. Now pre-generated adventurers were not unknown in Dungeons & Dragons scenarios, whether that is for A1-4 Against the Slavelords or Judges Guild’s Escape from Astigar’s Lair, but in most cases, such characters had actually been used when the scenarios had been played as part of tournament events at conventions. Whilst it was common practice to include them in such tournament scenarios when they were published, it looked very odd to expect the players to take characters that were not their own and play them for a whole campaign. Further, DL1 Dragons of Despair did not particularly support the creation of player characters. Considering the fact that the scenario introduces a completely new setting in Krynn, it is very light on details. The most notable of those given, are the lack of Clerics and divine magic and healing, the fact that dragons have not been seen in a thousand years, and that steel is far more valuable than gold. It is possible to play a Cleric, but at this point without divine magic, any Cleric is a poor man’s fighter. One oddity given the fact that the steel is more important and valuable than gold in Krynn, is that the many of the pre-generated characters are actually quite wealthy because their arms and armour are of iron or steel. Had this been fully thought out, then perhaps they should have been armed and armoured in other metals—bronze, perhaps? That would have added more flavour to the setting of Krynn. The very lightly sketched out setting also details the equivalent to Halflings in the setting—the Kenders with their infamous ability to taunt enemies. Although there different types of Dwarves—Hill Dwarves and Mountain Dwarves, and Elves—only Qualinesti are mentioned here, neither their mention or their existence has an effect upon DL1 Dragons of Despair. Indeed, this is the first impression of the contents of the module, that how little of the setting beyond the lack of Clerics and divine magic has on the adventure. Taking the eight pre-generated character in hand, at the start of DL1 Dragons of Despair, six of them start the adventure as old friends. Tanis Half-Elven, Sturm Brightblade, Caramon Majere, Raistlin Majere, Flint Fireforge, and Tasslehoff Burrfoot set out from the town of Solace five years previously to find any sign of either true clerics or the True Gods. As they come together once again, their joint mission having been a failure, they encounter Riverwind, and Goldmoon, two other potential player characters. Both are exiles from the Que-Shu plainsmen tribe, and notably in this first encounter, she imparts some of the history and nature of Krynn in a song, ‘Canticle of the Dragon’. Oddly, this song, which the players are expected to read out—or even sing, contains more detail about the history of Krynn than does the module for the DM! In addition, Goldmoon also carries a blue crystal staff, which as the adventure progresses, we will learn is capable of true divine magic and which becomes the McGuffin of DL1 Dragons of Despair. Once the characters are together, there seems to be little that they can do except visit Solace and wander around a bit. Throughout this initial part of the scenario, the player characters are nudged, almost herded, by interaction with the peoples of Solace and beyond, but increasingly by the appearance of masked and cloaked draconians, armies of which are edging ever closer—and they are after a strange blue staff! Eventually, the heroes are expected to go east to the forgotten city of Xak Tsaroth, and it is at its doors and in its depths that the adventure begins to shine. Perhaps the second physical impression of the module is how good the map of the dungeon is done. The wilderness map is perhaps somewhat bland, but the dungeon is done in isomorphic view to give a fantastic three dimensional view of the dungeon and a sense of its depth. Further, Xak Tsaroth is not a dungeon in the traditional sense, but a former city that has slid into a deep ravine into which the surrounding swamp empties… The result is a slimy, sodden, and mildewed atmosphere to the dungeon, the primary challenge in which is actually getting down to the lower levels as there are no stairs. There is little treasure to be found in the depths, but the Dragonlance Chronicles will prove not to be a setting in which random treasure will prove to be important. What offsets the gloom and doom of Xak Tsaroth are its inhabitants, the guttersnipe Gully Dwarves, there for comic relief and interaction rather than to be fought. Of course the point of the Dragonlance Chronicles was to showcase one type of dragon in each module and for DL1 Dragons of Despair, that was a black dragon known as Khisanth or Onyx. It makes its appearance in two notable scenes, one a particular showstopper that sees the dragon roar up out of a well and strike before diving back in again. Onyx’s appearance heralds the return of dragons to the world of Krynn after a thousand years and that ahead of a draconic invasion that begins in earnest in the next scenario, DL2 Dragons of Flame. As has been already mentioned, DL1 Dragons of Despair is a physically impressive module. The layout is neat and tidy, if pedestrian. What lifts it above that prosaic nature is the excellent art and the map of Xak Tsaroth. The art in particular makes for good hand-outs in addition to the song lyrics that the players have to read or perform at the scenario’s start. DL1 Dragons of Despair starts in an underwhelming fashion, with the player characters feeling as if they are being pushed around. In hindsight, this earlier section could have been better written and tied the pre-generated characters into the story much more strongly. The other weakness of the scenario are those pre-generated characters, which feel too similar and flawless—all but one are ‘Good’ when it comes to their Alignment and the only one who is not, is Neutral. Further that is no capacity in the scenario to deviate from this inherent goodness, making the roleplaying of the pre-generated characters feel strangely challenging but dull. Ultimately the second, finer parts of DL1 Dragons of Despair do a great deal to lift it to the status of a classic and its position of #25 on the list of ‘30 Greatest D&D Adventures of All Time’ published by Paizo Publishing in Dungeon #116—which is repeated here. Yet it set a precedent that would see scenarios focus on story and as a result become events to be experienced rather than adventures that the players could make their own with their characters. This is not to say that playing this or any other of the Dragonlance Chronicles scenarios would not be fun, but in DL1 Dragons of Despair the pre-generated characters do limit player options. My copy of DL1 Dragons of Despair was purchased in 1984 on a sunny trip to Bournemouth from a games mini-stall in an indoor market off Old Christchurch Road. I can recall being highly attracted by the beautiful cover and being disappointed by the initial parts of the adventure, though not by the dungeon. It would not be until a year or so later that I would play it and the rest of the series in a playing group that was so large that we would use characters that appeared in later modules. Thus I played Gilthanus, the Qualinesti princeling who would not appear until DL2 Dragons of Flame. Which is why I can better recall playing that adventure rather than DL1 Dragons of Despair—and yes, at the time I did enjoy playing these adventures. In hindsight, it would be interesting to revisit DL1 Dragons of Despair. As with adventures of its era though, not with Advanced Dungeons & Dragons, First Edition, as it just does not offer the storytelling mechanics that the setting and the backgrounds of the pre-generated characters would seem to demand. Perhaps Pelgrane Press’ 13th Age or Mindjammer Press’ Monsters & Magic would provide this? Then again, it would be even more interesting to have a more modern designer revisit this series and present the Dragonlance Chronicles anew?